When they say that Johnny Schuler wrote the book on pisco, that’s not quite true. He’s written two. For decades, Schuler has been Peru’s pisco ambassador, traveling around the world to educate industry professionals and the public alike about the spirit. He speaks regularly at wine and spirits events, and judges tasting competitions such as the prestigious Concours Mondial de Bruxelles. Schuler helped set the standards for pisco quality and production as a member of INDECOPI, an organization that protects consumer rights and monitors fair business practices in Peru. Any spirit seeking official designation as a Peruvian pisco had to be tasted and approved by Schuler. He is currently a member of the Comision Nacional del Pisco (CONAPISCO) and was a founding member of the National Tasters Guild of Peru, for which he served as president for 17 years. Schuler also hosts Por Las Rutas del Pisco, a TV show about the making and enjoyment of pisco. Johnny Schuler, Pisco Portón's Master Distiller. But it’s Schuler’s latest project that represents the culmination of his life’s work: he is the master distiller for Pisco Portón, a new entry in the burgeoning pisco category that launched in Los Angeles and a few other cities this month. I had the opportunity to sit down with Schuler at a recent tasting event at Caffé Roma, where he talked about his decades-long passion for pisco and his new endeavor. After meeting him in person, it’s easy to see how Schuler’s warm presence, softly lilting accent and enthusiasm for pisco have served him well in his travels. 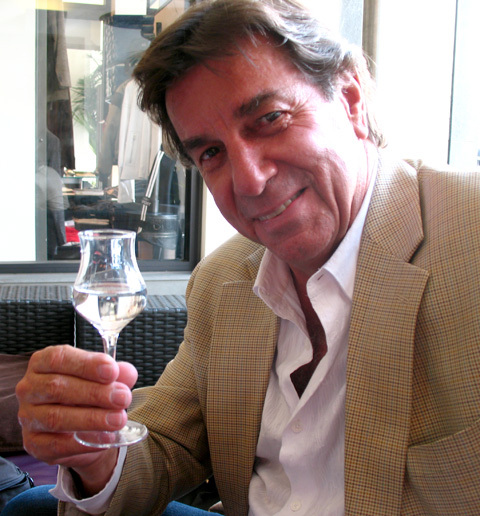 Of his devotion to pisco, Schuler said, “I don’t know if pisco discovered me or if I discovered it, but we are madly in love.” It was a love affair that began in 1977, when Schuler (already a well-established chef and restaurateur in Lima) was asked to be a fill-in judge at a pisco competition. After sipping dozens of expressions he was so impressed with their quality and diversity he dedicated himself to learn everything he could about the spirit and became one of its greatest advocates. For his work as a pisco ambassador, Schuler was awarded the Medal of Honor by the Peruvian Congress. Schuler stepped down as president of the National Tasters Guild in 2010, when he was approached by Texas oil billionaire Bill Kallop and his son Brent to create a new brand of ultra premium pisco for the U.S. market. Schuler had been offered to put his name on a pisco before, but the Kallops gave him free rein (and the necessary funds) to create what he thought to be the ultimate pisco. Schuler’s pride in the results was evident throughout the tasting event, which included an in-depth discussion of the distilling process and a tasting of the pisco itself. “Portón” is the Spanish word for “gate,” and Schuler compared his pisco to “a gate to a new world.” As Pisco Portón’s master distiller, Schuler oversees every aspect of production, from harvesting to bottling at Hacienda La Caravedo in Ica, Peru, the oldest distillery in the Americas (est. 1684). Portón’s logo is a graphic design of the hacienda’s front gate; a painting of the hacienda is framed by that same gate on the front of the Portón bottle. Thanks to the deep pockets of the Kallops, Schuler designed the multimillion dollar, state-of-the-art distillery to implement a mix of centuries-old distilling methods and modern, sustainable technologies. In keeping with tradition, gravity-fed channels (instead of electric pumps) move the pisco through the stages of fermentation and distillation. A rooftop garden converts carbon dioxide emitted by fermentation into oxygen, while water from the distillation process is recycled by a treatment system to irrigate the vineyards. Pisco Portón is made from a blend of Quebranta, Albilla and Torontel grapes, each chosen for their unique characteristics. Portón is distilled using the mosto verde (“green must”) method, which Schuler said produces the highest quality piscos. 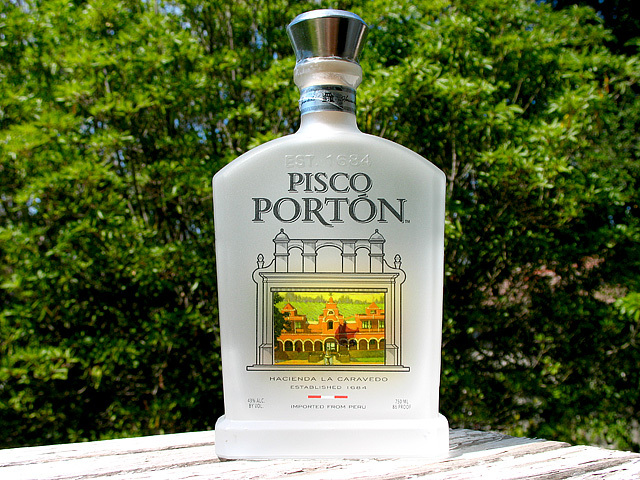 He said that Portón is currently the only mosto verde pisco available in the States. Mosto verde is an extremely expensive process, because not all of the grape sugars are allowed to ferment into alcohol and thus there is less pisco in each batch. An inordinately large amount of grapes is needed for the mosto verde method; it takes about fifteen pounds of grapes to produce one bottle of Portón. We then took our sips of Portón while Schuler described what each of the grape varietals brings to the pisco. There is a bit of heat on the floral and fruity nose, with notes of banana, grass and white pepper. Torontel grapes are known for their citrus and peach aromas, traits that can be detected on the nose as well as the palate. The pisco’s full body comes from the earthy Quebranta grapes, a non-aromatic varietal often used in puro (single varietal) piscos. Finally, the fragrant Albilla grapes give the Portón its long and velvety smooth finish. 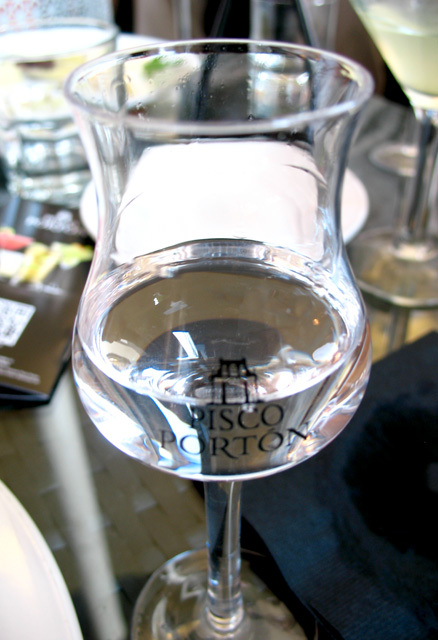 Pisco Portón is an impressive entry in the pisco category, a spirit that continues to win fans in a competitive market that is witnessing a renaissance of new releases. With the world-renowned Johnny Schuler at the helm of its production, Portón’s future looks to be as bright as the Peruvian sun in the Ica Valley. Pisco Portón is now available in Los Angeles, San Francisco, New York and Houston. Portón is expected to launch in a total of twenty-seven markets by the end of 2011. For more information, visit www.piscoporton.com. Nose: A bit of heat, fruity and floral with banana, grass, white pepper notes. Palate: Heat on entry develops into a rich and full body with citrus and peach. Finish: Long, smooth and warm. Another Peruvian favorite is the Chilcano, a tall and refreshing drink that is so popular an entire week (Semana del Chilcano) was devoted to it for the second year this January. Schuler said that the bar at Mayta, one of the top restaurants in Lima, has three dozen variations of the Chilcano on its menu. With such a simple recipe, it’s easy to see why the Chilcano enjoys such popularity and variety. 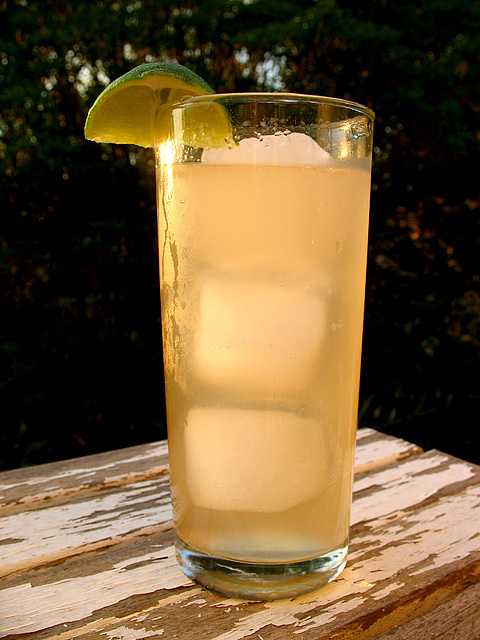 The fruity and floral Portón plays well with the ginger ale, and I’d imagine with ginger beer it would be just as nice. Add the pisco and lime juice. 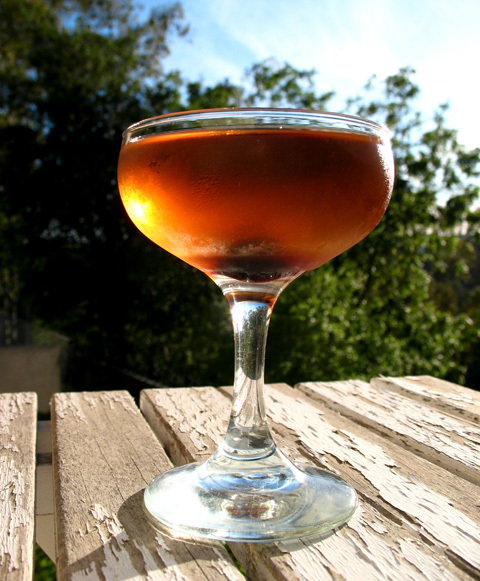 Fill the glass with ginger ale and finish with a dash of bitters.